• Child-care expenses. Assuming you have child-care expenses, remember to claim the lucrative child-care expense deduction, which reduces your net income. (Click here to download the form). But this claim is often audited; so, be sure to keep your child-care receipts. Reducing your net income is important because it is the base on which many benefits and refundable tax credits and benefits are calculated. The lower your net income, the greater your ability to access those credits and benefits. The Canada Child Tax Benefit (CCTB) is one of those benefits that are based on net income, in this case, family net income. It is a tax-free monthly payment made to eligible families and includes the National Child Benefit Supplement and the Child Disability Benefit. • Child Amount. When it comes to non-refundable tax credits, be sure to claim the Child Amount for each eligible child under the age of 18. The $2,131 claim is not income-tested and either parent can claim it; in fact, unused amounts can be transferred from one parent to the other. • Children’s fitness and arts activities. Check private activity receipts to see if you can claim the Children’s Fitness Amount and/or the new Children’s Arts Amount. • Disability Tax Credit. If you have a disabled child, you’ll want to claim the $7,341 Disability Amount, which, in the case of minor child, is increased by a supplement of $4,282 for a total claim of $11,523. This supplementary amount, however, can be reduced by the amount you claim as a child-care deduction. You will need a Disability Tax Credit Certificate, form T2201 completed by a doctor. • Public Transit Amount. Finally, be sure your young ones keep all public transit passes for a possible claim for the Public Transit Amount. By having his or her own in-trust account, eligible earnings — interest and dividends earned on “untainted accounts” — are taxable in the child’s hands. Because of the tax-free zone, the basic personal amount of $10,822, this usually allows the earnings to accumulate tax-free. Over time, planning around these rules but within the framework of the law will build assets in the hands of multiple family members, resulting in future income-splitting benefits. It’s Your Money. Your Life. File tax returns for all family members together, including minor children. If you think strategically about family income splitting, you will be able to accumulate capital in many family members’ hands. The objective is to unleash the potential each taxpayer has to maximize the tax-free zone of $10,822 and save significant sums over time. Evelyn Jacks, president of Knowledge Bureau, is author of Essential Tax Facts 2012 and co-author of Financial Recovery in a Fragile World. To purchase your books, visit www.knowledgebureau.com/books. The arrival of T4 and T5 slips — by the end of February — signals the official start of the annual tax-preparation rush. One important rule you and your tax preparer will want to follow is completing all family tax returns together, starting with the lowest-earning family member and progressing to the highest. This will allow you to take advantage of provisions for transferring income to children and provide savings opportunities for the young. Filing returns for minors. There are many reasons to file a tax return for minors. First of all, your minor child is taxable and required to file a return if he or she earned $10,822 or more in 2011, be it income from employment (for example, working at a local restaurant) or self-employment (babysitting and lawn-care services). But even if your minor’s income doesn’t meet that threshold, filing a return is important. Each year, 18% of his or her earned income will go toward creating RRSP contribution room; in time, when the child does become taxable, he or she will be able to contribute to an RRSP creating a RRSP deduction that will reduce income and taxes. This is important planning tool if you are going to be the one supporting your child when he or she attends post-secondary school. Before unabsorbed educational credits can be transferred to you, the student must first claim tuition, education and textbook credits to reduce his or her taxable income to zero. An RRSP deduction will reduce the student’s income, allowing you to transfer more of the credits to your return. Your minor child also needs to include in income any survivor and/or disability benefits from the Canada Pension Plan. This will boost his or her net income. If you are a single parent, this could be particularly significant because the claim for “eligible dependent” or spousal equivalent for tax purposes will be reduced or eliminated. But there is a tax special provision for minors available only to single parents: you can transfer taxable Universal Child-Care Benefits (UCCB) to the child, and he or she can include it in income. This will be of advantage to you if you are in a higher marginal tax bracket than the child. It’s Your Money. Your Life. File tax returns for all family members together, including minor children. The objective is to maximize the tax free zone of $10,822 and, if necessary, reduce income levels further with an RRSP deduction. What’s required is that the minor has eligible RRSP room, which is created by filing a return. This filing strategy can create savings on a supporting parent’s return as well, with the transfer of certain available tax provisions — to the benefit of the entire family unit. We don’t often think of the taxman as cupid, but this month, you may have received a Valentine’s Day treat: the timely delivery of your 2011 RRSP Deduction Limit Statement. Canada Revenue Agency dropped this simple, one-page form — complete with easy-to-read definitions — into the mail early in February, to remind eligible Canadians of their correct RRSP deduction limits. Refundable tax credits such as the federal GST/HST Credit, Canada Child Tax Benefits and Working Income Tax Benefit. Many provinces have refundables, too, so RRSP-reduced net income can influence cash flow throughout the year. Non-refundable tax credits, such as the Spousal Amount, Age Amount, Caregiver Amount, and Tuition, Education and Textbook amounts, to name a few. Social benefits such as the Old Age Security and Employment Insurance benefits, which are clawed back at certain net-income ceiling thresholds. Moreover, a lower net income can also decrease provincial pharmacy deductibles and per diems at nursing homes. Your RRSP deduction limit for 2010 and how much of that you used on last year’s tax return. That leaves you with your unused RRSP deduction limit at the end of 2010. Your RRSP deduction limit for 2011, which may include a variety of adjustments related to your employer-sponsored pension plan, if you have one. Those adjustments might increase or decrease your RRSP deduction limit. This second figure is next to a prominent figure (A). Find it and circle it. For most people, this is the exact amount you can contribute to your RRSP and you should do so by Feb. 29, 2012, if you are to get the deduction that will reduce your 2011 net income. It is very helpful to show the statement to your financial advisor, or the person at your financial institution who will sell you the RRSP. That’s because this form also notes whether you have any unused RRSP contributions available for 2011. This is labelled, albeit not as noticeably, as Amount (B). That’s the amount you previously invested in your RRSP, but have not yet deducted on your tax return. If that’s too much information and the dreaded tax tremors are back, visit your tax advisor, who will know what to do about your over-contribution and excess contribution. Just between you and me, tax pros tremble at the thought of having to complete the dreaded 1% penalty form, a T1-OVP, so they’re motivated to keep you out of the penalty zone! It’s Your Money. Your Life. Treat yourself to more cash flow throughout the year and more accumulated, tax-deferred capital by looking over your 2011 RRSP Deduction Limit Statement and then making your correct RRSP contribution by Feb. 29. Evelyn Jacks, President of Knowledge Bureau, is author of Essential Tax Facts 2012 and co-author of Financial Recovery in a Fragile World. To get your copy, see www.knowledgebureau.com/books. What Should Be Taxed More — Current or Future Income? Governments getting their fiscal houses in order are asking taxpayers to depend less on government services and take more responsibility for the future. But those same taxpayers are wrestling with two layers of taxes: taxes on income, which erodes current income, and taxes on capital appreciation, which erodes future income. This seems counter-productive to the concept of self-reliance. That begs questions about our tax system. Should current income be taxed more than the future income that capital appreciation provides, as happens now? Should they be taxed equally? Or should capital appreciation — often seen as the purview of the wealthy — be taxed more than current income? These are very important considerations, especially in these volatile times, and there are arguments to be made on both sides. On the side of lower taxes on current income is the time value of money.Thanks to high taxes on current income, taxpayers have fewer after-tax dollars to put into the tax-advantaged savings vehicles at their disposal: Tax-Free Savings Accounts, which create tax-exempt income from after-tax dollars, and tax-deferred registered accounts such as Registered Retirement Savings Plans or employer-sponsored pension plans. Unfortunately, millions of Canadians are using their after-tax dollars to fund non-discretionary needs and do not have enough “redundant income” to save, so they cannot be self-reliant (see “Contribute to your RRSP,” Knowledge Bureau Report, Feb. 1). But if you are saving and accumulating wealth, you come up against a second erosion of wealth — the tax on accumulated capital. Many think the asset-rich should pay more and government taxes at the time of actual sale or “deemed disposition” (death or emigration, for example) should be higher. We want to be very careful here. If governments are encouraging self-reliance, they don’t want to rob future generations of the ability to earn income on that inherited capital — or future governments to tax it. As the large, baby-boom generation moves into retirement, boomers will pay less personal income taxes — the largest line of revenue for governments in recent years — and their contribution to federal coffers will decline accordingly. That presents a challenge for overcommitted governments. If future government revenues are to be maintained, that capital, intact, must be available for both future generations and governments. Yet another factor affects capital accumulation: because the adjusted cost base of a capital asset is not indexed to inflation, any increase in inflation subjects the value of capital to a powerful and hidden tax, one that’s based on inflated values rather than real values. Government coffers win in times of high inflation; investors lose on a net basis. Together, inflation and taxes quickly erode the real value of wealth — that is, purchasing power — and that risk is inherent in capital appreciation. So, which should be taxed more — current or future income? There is no easy answer. Both the performance of the investments you choose and their ability to grow your capital, and the time value of money are important. And you can’t discount current market risks or the risk future taxation and inflation pose to your capital and income. All affect the sustainability of family net worth. Your best strategy is knowledge. It’s Your Money. Your Life. Do you understand how your current income and future income from accumulated assets are taxed? If you are not sure, ask your tax and financial advisors. Given that we are in the midst of a long period of volatility and low returns, you should protect your capital from the eroding effects of tax and inflation and manage it — on an individual, family and community basis. Evelyn Jacks, President of Knowledge Bureau, is author of Essential Tax Facts 2012 and co-author of Financial Recovery in a Fragile World. 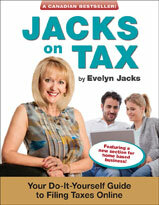 Mrs. Jacks will be launching her books and addressing today’s financial and tax issues in Winnipeg on Feb. 9. To register, click here. Author Evelyn JacksPosted on February 8, 2012 February 7, 2012 Categories Income TaxLeave a comment on What Should Be Taxed More — Current or Future Income? This week, a friend in business lamented the shocking loss of a key employee. The unanticipated death closed down the firm for several days as fellow employees absorbed this traumatic loss. It was the tenth death within this circle of employees, suppliers and clients and their respective families. When it rains, it often pours. Although very difficult emotionally, conceptually we understand the consequences of human frailty and demise. As humans, we do our best in times of great change: we rally around those who are vulnerable. Again and again, we cope with the stages of grieving — moving from shock and denial to pain and guilt to anger and bargaining and, finally, to the beginnings of acceptance: reflection, re-organization and re-construction. People around the world are reacting to the disruptive and sometimes devastating effects of the extended global financial crisis with this same shock, denial and anger. And the challenge for governments is to manage these global economic threats to our fiscal health while keeping cherished social benefits in place. In Canada, there are big issues ahead for the large, baby-boom generation and the government that counts on boomers’ continued contribution to its tax coffers. For their part, boomers are at the front door of retirement and are facing significant changes to Canada Pension Plan benefits and, possibly, access to Old Age Security. This comes after a decade of zero returns on their savings or, worse, the reduction or demise of their employer-sponsored or private pension plans. For its part, the federal government is already seeing interest charges on our public debt and support to the elderly eat up 11¢ and 13¢, respectively, of a dollar of government revenue. On the revenue side, the federal government counts on personal income taxes to provide 48¢ of every dollar of revenue collected. This source of revenue will be difficult to grow as this significant group of taxpayers heads into retirement. Fortunately, Canada is in a good position to balance global economic threats and preserve social benefits. According to the federal Department of Finance’s Fiscal Monitor, released last month, the budgetary deficit for the first eight months of the government’s 2011-12 fiscal year was $17.3 billion, vs. $26 billion a year earlier, a 35% improvement. Net tax revenues were up; program expenses were down. Public debt charges, however, increased and that is a threat for retirees. Higher deficits cost more money to service and, should interest rates rise, the ability to maintain or increase existing social benefits will be squeezed. It’s important to anticipate that now so you can chart an alternate course if required. And so it goes: the burden of the healthy is to manage the consequences of decline and loss with grace and strength and to take the very best possible care of those who are vulnerable. It’s Your Money. Your life. Things change. This tax season, take the time to find ways to save more of your income, so you can build and grow family wealth. Challenge your tax advisors to dig for every tax deduction and credit to which you are entitled, so you can reduce non-deductible debt and invest more tax-efficiently. This is one of the best ways to build your pensions and investments so you’ll be ready for unexpected personal and/or economic shocks. Evelyn Jacks, President of Knowledge Bureau, is author of Essential Tax Facts 2012 and co-author of Financial Recovery in a Fragile World. Mrs. Jacks will be launching her books and addressing today’s financial and tax issues in Toronto on Feb. 7 and Winnipeg on Feb. 9. To register, click here.